The seventh annual get-together of railfans - the IRFCA Convention - was set in Kolkata in the last week of January. I had not attended one since my first and last convention that we hosted in Bangalore (January 2009). This time around, I decided to make it to the convention - tickets were booked in advance, rooms reserved.. all set. 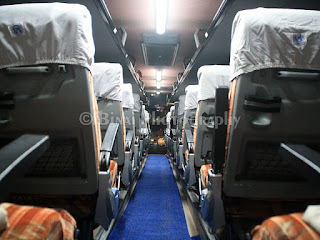 I was to take the Coromandal express from Chennai to Kolkata on the 26th of January 2012. 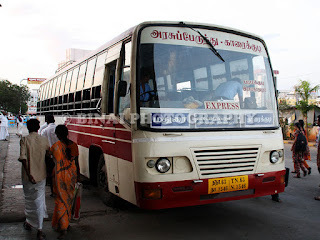 I decided to be in Chennai a day earlier, so that I could do some local bus-spotting and some trainspotting. I was sure that I would take a bus from Ernakulam to Chennai, but was confused on which one to take. Kallada was ruled out since they go via Pondy. Parveen was ruled out because it was a Mercedes, and they too go via Pondicherry. Now the tie was between KPN and SRM. Sona never featured in my thoughts at all. I decided to take KPN since it leaves late from Ernakulam, and I had no deadlines to meet in Chennai. I made a booking through their office - the ticket rate was Rs. 1110 (Rs. 80 less than their website). They issued a printed ticket, printed on their preprinted ticket stock - that was professional. Their service departs at 2015hrs and they 'claim' an arrival at 6AM (impossible, I said to myself). January 24, 2012: Fresh from a late-running experience for a KaSRTC bus at Ernakulam, I decided to leave home much earlier than required. During my previous experience, I left home late, and managed to successfully delay my bus (read here). I left home around 1730hrs, for an 8pm bus. 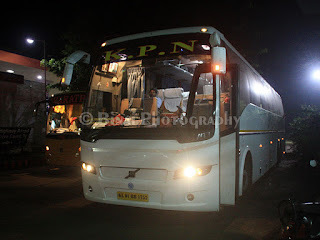 I got in a KSRTC bus to Ernakulam from Kodungallur around 1755 or so - thankfully it was a Leyland (RAM215) this time. The bus dropped me at Ernakulam by around 1915 or so. Since I had to reach KPN only around 2000hrs (just about 1.5~2kms from Ernakulam Jetty, where I got off the bus), I decided to try my luck getting a bus there. I got a bus around 1940~1945 (I left a lot of buses, playing inky-pinky-ponky..). I was at KPN by 1950 or so. KPN's office at Ernakulam is on MG Road, next to Hotel Woodlands. It is at the basement of a shopping complex - its a small place, with chairs arranged along the walls. The office was not very clean - paint peeling off from the walls, dirty seats, et al. It was pretty hot in the office - there was hardly any ventilation at all. The guy in the office did not want to check my ticket - he just asked "which bus". When I replied 'Chennai', he just asked me to wait. The clock ticked past 2000hrs, but there was no sign of the bus. Some passengers got impatient and asked where the bus was - the guy said it'll come in 5 minutes. The TV was switched on, and played a Tamil channel. The bus came in at 2015hrs - the drivers walked into the office. There was some traffic restriction on the road, which delayed them badly, it seems. Boarding commenced at 2020hrs - there was no cleaner or attendant. The drivers themselves took care of passenger baggage, while a guy from the office checked tickets. We had 9 passengers from the starting point. The ticket checking, and cross-verification took some time - the waybill was signed (yes.. KPN has a government bus style waybill) and we were good to go. We started off at 2037, late by 22 minutes. 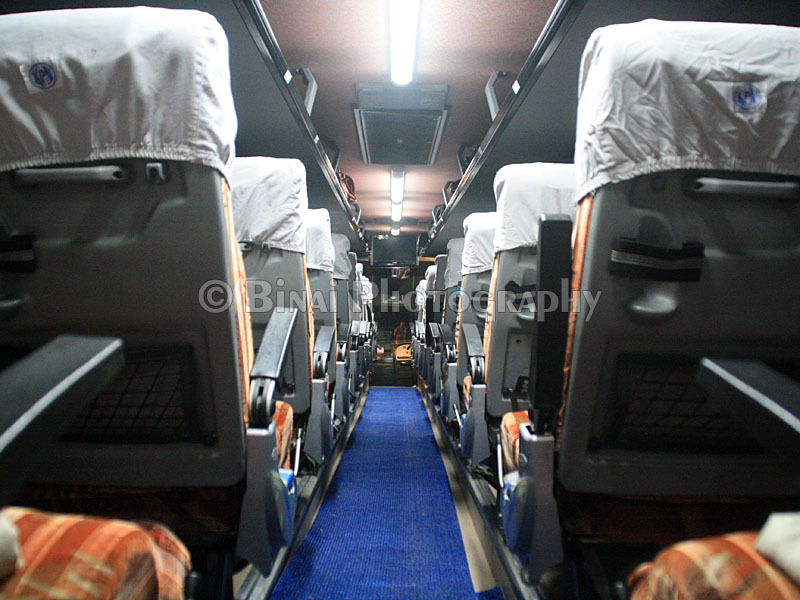 The bus: KL-01-BB-1757. It had over 2.14lakh kms on the odo, but well-maintained. They did not play any movie or music in the bus. The AC was set to a comfortable 23 deg. The drivers were chatting to each other, and were commenting on the general driving habits in Kerala. We picked up 2 passengers at Kalamassery and kept going after that. The driver at the wheels was a guy with salt-and-pepper hair - he had very good control of the bus. He kept good pace and used the horn to the minimum. Our next pickup was at Angamaly - two passengers joined here. One of them did not have a print out of the ticket, but had the message. The driver insisted on getting a printout, but later agreed to the message - he wrote down the ticket number on a bit of paper and kept it along with the ticket counterfoils. We left Angamaly at 2131. We pulled in to Hotel Jubilee for dinner at 2141hrs. I had brought dinner from home - finished it during the break and headed out for some fresh juice, and later went shutter-happy. We started off after the break at 2216hrs. During the break at Pongam. 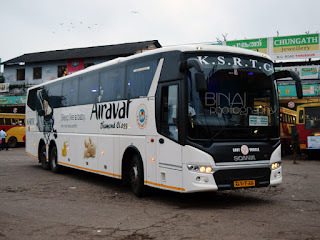 Its a Bharathi Tri-Axle Merc behind. Even as the bus was crawling out, the drivers were busy discussing something. It later came out that they had missed one pickup! The drivers checked the chart provided to them again and again - it mentioned only 13 passengers, and all the 13 were on board - so how did they miss a passenger? Later, a couple of rounds of phone-calls to the KPN office in Ernakulam followed. The passenger was to be picked up at Aluva, but the drivers were not told of the same. They were told of the pickup well after the bus passed the point. 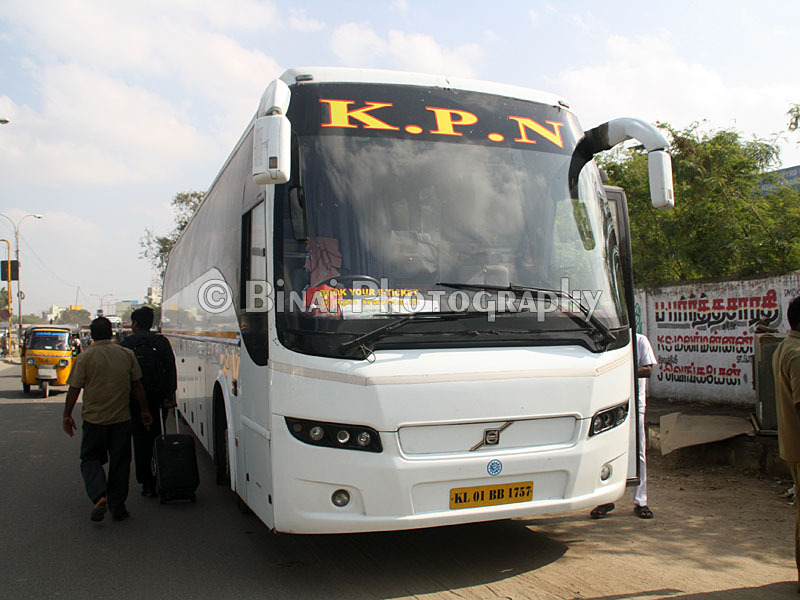 KPN then sent the passenger in a following bus and our bus was told to wait for the following bus. The drivers found out the telephone number of the following bus guy and called him up - that bus was just pulling in for dinner! Our driver was irked by the callous attitude of the guy at Ernakulam office and a round of expletives followed. Enraged, our driver decided not to wait for the following bus - since it would catch up with us at Salem anyways during refueling. We finally leave at 2245hrs from the hotel (we spent over an hour here due to the confusion). 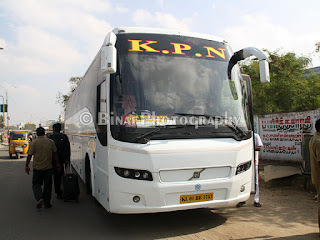 Our bus had over 2 lakh kms on the odo - but was riding perfectly well! There was neither squeaks anywhere nor abnormal noises from the bus. The co-driver headed to the berth at the rear, while the guy at the wheels clearly meant business. He The driver's phone kept ringing all the time, but he did not attend the call. Later, the guy at KPN's office called up a passenger in the bus and asked him to give the phone to the driver - the driver was hesitant to attend it, but later answered. That was a call from KPN-Salem. The driver was asked to explain why he did not pick up the passenger at his pickup point - some long drama ensued, with the driver complaining about the Ernakulam officer. Later, our driver said we'll stop at Walayar - for not more than 10minutes. If the following bus does not catch up then, we'd keep going. I slept sometime after this communication. I woke up when the bus was parked at Walayar - it was around 0030 then. Less than two hours from Koratty to Walayar was decent - given the state of roads in Kerala. the wait continued till about 0100hrs, when the following bus (KPN's Multi-axle coming from Trivandrum) joined us. The passenger joined our bus - the driver asked him what the 'story' was: It turned out that the ticket was sold by an agent just a while before the bus left Ernakulam. The dumb-head agent called KPN after he saw the bus just zipping past his office! He then called up KPN and complained the bus went without stopping, and all the drama unfolded. In the meantime, the driver got back to the wheels and we were back to flying. I slept after the bus got moving - wokeup only as the bus stopped somewhere near Salem for a "headcount". After a quick headcount, we continued moving. We pulled into KPN's Fuel Station at Salem, sharp at 0345hrs. 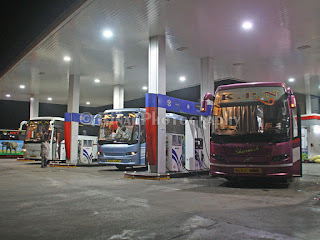 That is one huge petrol pump - can take in four buses together. It has one huge toilet complex - very clean and well-lit. The place has a small bakery and two ATMs! Our bus got a pump as soon as we reached there - so we did not have to wait. During the fuel break at Salem. The bus on the extreme left (white) was mine. The other two were heading to Bangalore. 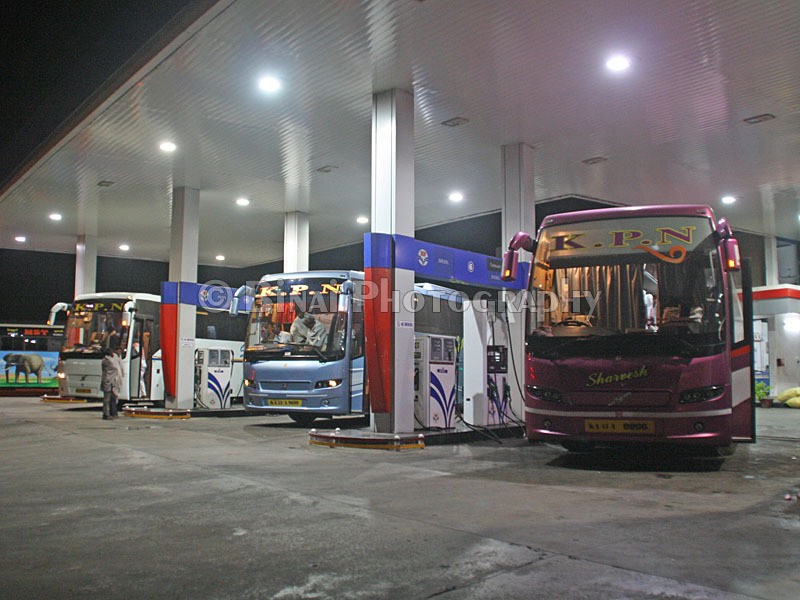 Our bus took in 310lts of diesel, and we got moving at 0400hrs. The driver now changed, and the second guy was quite fast. The first driver got off at Salem - so it was now a "single" crew operation. The driver picked up speed very quick and we were doing close to 110kmph in no time. I was asleep in no time. I woke up around 0630~0700hrs - we were still belting at 110kmph. The driver used the horn to the minimum - there were no sharp brakes, not dangerous turns or rash overtakes. We were running past Walajah bypass around 0730hrs - my GPS kept showing speeds in the range of 105~110kmph all the time. We dropped a passenger on the highway at Sriperumbudur. Traffic worsened after Poonamalle - it was literally bumper-to-bumper traffic as we neared Chennai. It was an absolute crawl from Maduravoyal to Koyambedu. FM Radio was switched on in the bus as we neared Chennai - quite a lot of melodious songs were played on FM - this perhaps kept passengers a bit relaxed even as the bus was getting delayed. I was dropped outside Koyambedu CMBT exactly at 0925hrs - 13hours end-to-end from Ernakulam, including heavy traffic from Poonamalle bypass to Koyambedu - not bad, I felt. 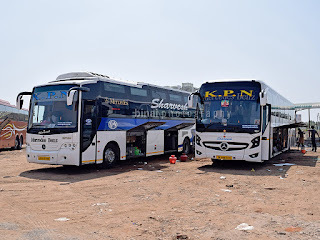 Remarks: Mis-communication between the agent and KPN's office in Chennai created a very huge delay for the bus - we lost over an hour of precious time in Kerala itself due to the confusion. Both the drivers had very good control on the beast - they were well behaved to passengers, and kept their cool to questions. Both of them were properly uniformed. The drivers maintained pace for most past of the journey, and despite traffic and the confusion, managed to get to Chennai in 13hours. The bus was well maintained despite its age. Good going KPN - just make sure you successfully regain your lost reputation - you have the capacity to become the bus in the industry.